Choosing a right career option is the most vital decision in everyone’s life. 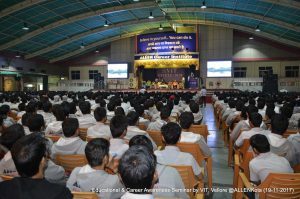 In order to guide students about various career options and job opportunities in science stream, Vellore Institute of Technology (VIT-Vellore) organized a seminar at Allen Career Institute, Kota for Pre-Engineering Aspirants of Allen Career Institute Kota on 19th November 2017. The seminar started with the welcoming of VIT’s Director, Admission Department Dr. K. Manivannan who provided various information pertaining to career opportunities. Vinod Kumawat(Vice President, Allen Career Institute) and Nitesh Sharma (CMO) were also present in the seminar. Addressing the students Dr. K. Manivannan said Kota is providing future doctors and Engineers to the country. Allen is imparting quality education along with spiritual values to the students. 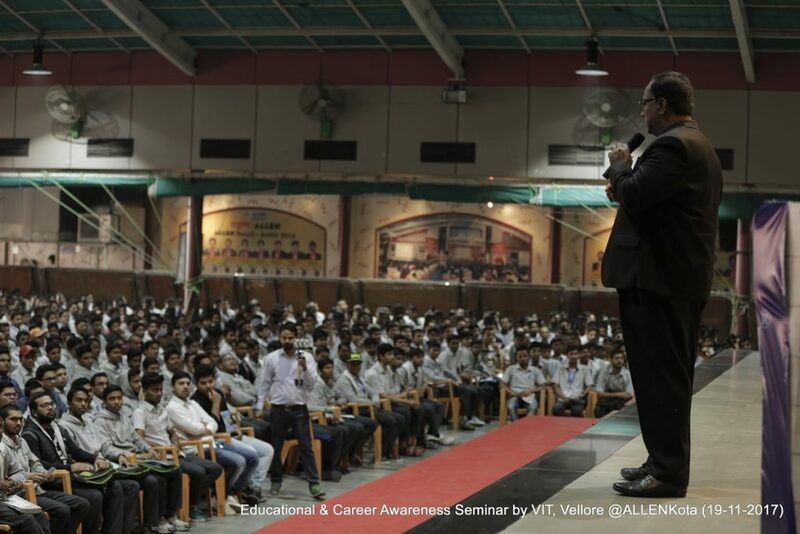 Every year students come to Kota to fulfill their dream and Allen is giving them a platform to achieve their goal. Speaking on the occasion he said, Students may go through a dilemma of choosing a career after completing their Xth, XIIth. Apart from the top common career options such as Medical and engineering, numerous other options are also available. It is important that students should change the trend and begin to think about options open to them, it will help them to choose the career path that best suits them. The choice of the career should depend on the job prospects of the field and most certainly the interest of the student. Students should explore what each area of studies is about and what it offers after studies as it is possible that today’s scenario may change in next five years. Dr. Amit Mahendrakar, Dean of Student Welfare(VIT) further added that hard work and strong willpower is the only mantra for the success of students. He said that the number of female engineering students has grown over the years. Today girls are no less than boys in any field, engineering has become their preferred choice. We can see that many Female students are also coming to Kota for preparation of IIT JEE Entrance Exam. They are determined by their goal. Students were also told about the admission procedure in VIT Bhopal, Amravati and other centers. Dr. K. Manivannan told about various courses available in VIT, through which students can choose the desired course and make their career. Every year almost 2.5 Lacs students appear for VIT entrance exam.